18:25 - Excitement as Biggie announces that the Store Room is now open for Rubies shopping. 17:58 - Selly is remorseful as she relieves her Save and Replace. She says she feels bad about Koketso's Eviction. 17:00 - Cleo tells Biggie how much she enjoyed her Rendezvous Treat with Hakeem. 14:00 - Bolt conveniently forgets Beverly's name when Biggie asks him how he feels about the new Diamonds. Isn't he supposed to be hitting on her? 13:40 - Beverly says she didn't like The Power of No because she fell victim to it last week and missed an opportunity to contest for the HoH crown. 13:24 - It's time for Diary session in Diamond. Fatima tells Biggie that she feels irritable, tired and bored. 12:35 - Bimp tells Melvin that the new hip hop artists have nothing on guys like 2pac, Biggie Smalls and Dr Dre. Melvin tells him he loves his Nicki Minaj tracks. 11:39 - Diamond Nomination Results: Bolt - 5, Biguesas - 4, Nando, Dillish & Annabel - 3, Motamma & Betty - 2, Feza, Melvin, Beverly & Hakeem - 1, Bimp & Fatima escape with 0 Nominations. 10:40 - As Hakeem walks out of the Diary Room, Motamma asks him about his loud fart that actually woke her from her sleep. 10:30 - Feza laments about water shortage in her country while having breakfast with Motamma. 10:25 - Pokello and Natasha lead Ruby Nominations so far with five Nominations each. 10:05 - Ruby HoH Selly Nominates Pokello and Natasha, Bassey goes for Selly and Elikem, Pokello puts Selly and Oneal. 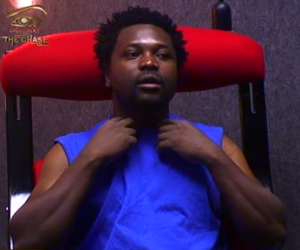 09:53 – Selly asks Oneal for strength before entering the Diary Room for her Nomination Session. They says a short prayer together. 09:40 – Elikem is first to nominate two Housemates for possible Eviction. He nominates Malawi’s Natasha and Sulu from Zambia. 09:35 – Cleo and Pokello are still trying to figure out how Emerald House fits into the game. I want Natasha to stay and Pokolo goodbey girly. please Natasha stays, she is entertaini.........ng. a gossip or not, its part of the game. Natasha has a wicked vibe about her. the way she stares at housemates live me stone cold. I prefer her to Pokello though.